Harvard Business School Professor Clayton Christensen coined the term disruptive technology to describe a new technology that unexpectedly displaces an established one. Disruptive technology lacks refinement, may have performance problems because it is new, and appeals to a limited audience – a perfect description of electric vehicles. The two-day conference and exhibition in San Jose, California is showcasing not only electric cars but also tractors, marine vessels, aircraft, buses, taxis, bicycles, motorcycles and golf carts, work and commercial vehicles. Dr. Harrop, chairman of IDTechEx Ltd., the British company that organized the show, lectures and consults internationally on electric vehicles, energy harvesting and printed electronics. Worldwide, about 1.6 million pure electric cars and hybrids, will be sold this year, he estimates, but the total number of all types of EVs sold will be closer to 39 million. Many of those will be e-bikes, so popular in the Chinese market. Banking on that trend, Saturna Green Systems Inc., of Vancouver, Canada, exhibited the next generation of wireless, location-based services for electric two and three-wheel vehicles. On Wednesday, Saturna announced an agreement with New York-based evolve motorcycles to incorporate Saturna’s wireless communications platform on evolve’s electric scooters and motorcycles. This is the first time that location-based service and telematics devices have been installed on an electric scooter assembly line. The show introduced electric vehicles not seen elsewhere, such as the new Soltrac solar-charged battery-powered electric crawler farm tractor and a new hybrid tractor from John Deere, a company that introduced its first hybrid machine, the award winning 2500E Greens Mower in 2005. A quick survey of trends indicates that the demand for electric vehicle charging stations is expected to sextuple in the next decade, particularly residential car charging stations. While Japan is the leader, India and Korea are moving fast in the EV market, speakers said. China has the largest potential market for electric vehicles. 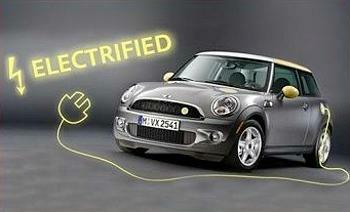 Over 90 percent of the world’s electric vehicles are made in China, most for domestic use. China mines and controls 95 percent of the world’s rare earth reserves used in the hybrid car batteries, motors and other key components of today’s electric vehicles. But Toyota “has developed a way to make hybrid and electric vehicles without the use of expensive rare earth metals, in which China has a near-monopoly,” reports Japan’s Kyodo newswire. Toyota could start to utilize the rare earth alternative within two years.